What Might This Mayoral Election Mean? Is Bill de Blasio a symbol of an age of political transition or is he something else? The post-mortems on the New York City Democratic mayoral primary have been pouring in, despite the fact that the election is not over yet. Democratic voters had choices from Christine Quinn (Bloomberg’s 4th term), Bill de Blasio (a city liberal of the old mold), Bill Thompson (who staked out a third way between Quinn and de Blasio) and Anthony Weiner (who might have had a chance if not for his personal foibles, which are many). A de Blasio victory in these primaries might presage a new era in American politics. The general election will, presumably, feature the Democrat Bill de Blasio against Republican Joe Lhota. Lhota will be a tough candidate, especially if Bill Thompson is able to secure a runoff election. A Democratic runoff is already conjuring up memories of 2001, when Bloomberg won his first term as Pharaoh partially due to the internal wars of city Democrats. But runoff or not, Lhota’s strategy against de Blasio will be predictable: paint him as an irresponsible liberal who will return the city to the bad old days of the 1970s and 1980s. The message will certainly resonate with older New Yorkers, not to mention the younger business-minded voters on Wall Street. But political futures are not made on old voters, a lesson the Republican Party nationwide has been slow to learn. De Blasio has tapped into the same vein of young voters as Obama did in both of his elections. The late teen and early 20-something of today is more likely to be part of a minority group and tolerant on social issues like gay marriage and marijuana than the young voter of 35 years ago. They also have been coming of age in the world of the conservative revolution and that world is just as rotten as the liberal world of the Koch and Reagan ascendancies. Their overall liberal views on issues of class and culture make them less susceptible to the fear of class and culture warfare preyed upon by conservative candidates. In short, the past 10-15 years have been ripe soil for future voters who reject the Reagan Revolution. Perhaps a Bill de Blasio mayoralty will be a laboratory for a new national political program, a role New York City has played many times in its history. A good way to discern how much of a laboratory the city might be with de Blasio is to look at what he does on education. Many educated people are hoping and predicting that the de Blasio victory means that Democrats at least reject Bloomberg’s corporatization of public schools that has erroneously been dubbed “education reform”. Their hopes have some foundation considering de Blasio’s generally friendly history towards labor in the city, not to mention his out-and-out rejection of most of Bloomberg’s legacy as the “education mayor”. He consistently took the most anti-Bloomberg stance whenever he was asked about education policy, famously saying that “there is no way in hell that Eva Moskowitz should get free rent” when asked about charter school co-locations. Those types of quotes were probably good enough to pry many teachers away from Thompson and give heart to the defenders of public education, me included. However, promises in the primaries and promises in the general election are two different things. And promises in general compared to action while in office is something else entirely. Education reform has been a sharpening stone on which politicians of both parties, but especially Democrats, have honed their credentials for national office. Cory Booker and Andrew Cuomo have become up-and-comers largely owing to their school reforms, which included taking on unions and injecting the private sector into education. In order for Bill de Blasio to truly set himself apart from the rising New Democrats (who are not so new anymore) in the Clinton/Obama mold, he must keep singing his current tune on education throughout the general elections and then in office. 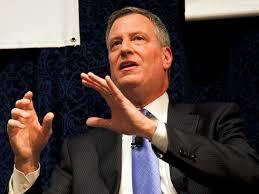 As mayor of New York, de Blasio would be in the national eye. Bold leadership on his part might point the way to a new path in American politics. Will he sacrifice a bold education policy that respects schools as public institutions to bold reforms in other areas on which he might make more headway? If he does this, the new road he paves will make corporate school reform a reality for at least another generation. This is why Democrats can be much more dangerous to the American left than Republicans. Just as instructive as keeping an eye on de Blasio’s education policy in the coming weeks and months is keeping an eye on how the UFT reacts to him. The union endorsed Bill Thompson early in the campaign season, mostly because he seemed like the only potentially successful alternative to Christine Quinn. This was back when de Blasio was polling in the single digits and Quinn was presumed to be the nominee. As usual, the UFT backed the person who did not win, although all of the money and resources they poured into Thompson’s campaign surely helped in smacking Quinn down to the three spot, where a runoff is out of reach for her. However, they continue to back Thompson even when it is clear that he would not win in a runoff, a runoff that would do nothing but allow Joe Lhota to consolidate his resources for the general election. Perhaps Mulgrew is pressuring Thompson behind the scenes to concede. The sooner the Democrats get behind Bill de Blasio, the better it will be for them come the general election. If de Blasio does become mayor, will he cap charter schools? There are billions of reformy dollars coursing through this city and they could launch a massive propaganda campaign against education policy that threatens their share of the increasing education “market”. If it really does come down to a case of the reformers vs. de Blasio, I am not at all sure where the UFT would stand on most issues. If the UFT feels that de Blasio might lose in a propaganda war for the hearts and minds of New Yorkers, they might cast their lot with the Rhee crowd just so they avoid the “obstructionist” label that unjustifiably dogs them. In short, the question might come down to: will the teachers’ unions be on the front lines of a new leftist direction in American politics or will they try to temper any such development? This will not be the first time this question is asked in NYC, the 1968 strike especially being a moment when the UFT actively stood against a leftward turn in education policy. But the teachers I know and read on the internet are hopeful that a de Blasio mayoralty will mean a new contract and a renegotiation of the evaluation system. The real dreamers have hopes for retroactive pay and an opting out of New York City from the state’s inclusion in the Race to the Top program. These are the issues by which teachers will largely judge Bill de Blasio. We hope that he is able to recognize how deep the Bloomberg school reforms go. It is not just about charter schools. It is also about the deskilling of the profession and the autocratic line of command that runs through the system. A complete dismantling of the Bloomberg Way in public schooling in favor of a more democratic approach would certainly be a major blow to the nationwide school deform movement. We cannot be sure if the left here and around the world is resurging or if this is just a tempest in a teapot. We can only be hopeful. In that hope, we have to be mindful that we are living in exciting times where things are shifting and do what we can in our own lives to help shift it in the right direction. This entry was posted in An Embattled Career, education reform, Politics, School and tagged Bill de Blasio, Bill Thompson, education, Education Reform, History, Labor Unions, NYC Mayoral Elections 2013, Politics, Race to the Top, School, UFT. Bookmark the permalink.